The method is absolutely specific for B19 virus and is able to detect 10-100 genome copies/reaction. 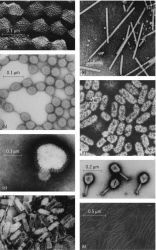 ISH assays for the diagnosis of B19 virus infection can yield information on both the presence and distribution of viral nucleic acids with preservation of cellular and tissue morphology; they therefore can integrate the results obtained from nucleic acid amplification techniques. To investigate the suitability of the PNA probe, we first performed the novel PNA-ISH assay and the standardized DNA-ISH assay with archival specimens (cell samples and tissue sections) that previously tested positive for B19 DNA by PCR-ELISA and then with 15 consecutive clinical specimens sent to our laboratory with a clinical suspicion of B19 virus infection. Plasmid pHRO contains a 4900-bp viral segment, corresponding to nucleotides 346-5245 of the B19 virus genome (National Center for Biotechnology Information Genome Database NC 000883), inserted in plasmid vector pGEM3Z (Promega). Serum samples were obtained consecutively during a 12- to 16-month period from three different individuals with documented persistent B19 virus in the peripheral blood associated with clinical symptoms typical of B19 virus infection, such as recurrent cutaneous rash and arthropathies. B19 virus can be present in the blood at very high concentrations, and because of the frequency of viremic individuals in a donor population, contaminated blood might be inadvertently included in the manufacturing of plasma pools (13), leading to measurable contamination of the final blood products (14).